By 3:30 pm, the sun already starts to set in the wintry streets of Copenhagen, and even if I know that this is what the motionless month of January keeps for Northern Europe, it still takes P. and me by surprise. When we arrive by mid-afternoon at the central station downtown, it is already quite dark and snowing lightly. But in fact, it does not stop anyone from filling the streets in big numbers. And then, everyone is so over-the-top friendly that it does not matter if the sun sets so early. Denmark, or at least Copenhagen, is not the place to visit to practice your beginner’s school Danish, as we soon discover. Every single person we talk to speaks English impeccably, making me feel particularly self-conscious of my pronounced French accent in comparison. “How do they do it?” I whisper in P.’s ear, feeling a hint of jealousy. Whenever we meet someone new, we politely ask the “do you speak English?” question, but by the fourth or fifth time, we realize that it sounds like a silly, unnecessary question, perhaps even an insult. I cannot help then but read “Of course I speak English” on the face of every passer-by that I meet. If I were to believe in dreams-that-come-true, then our visit really starts like one. The charming hotel where we decide to stay is conveniently located a few minutes away from the main train station, in a central part of town offering many lodging options. 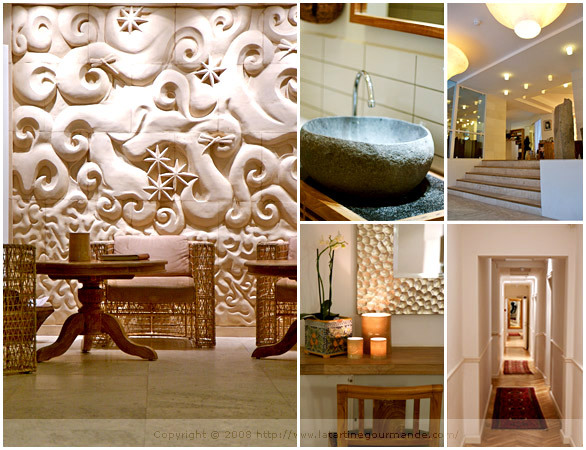 While the staff is helpful, generous at giving us many tips, such as where to eat on the night we arrive, we also find the rooms and interior design carefully manicured, with an organic, minimalist decor — a blend of traditional Balinese style with modern art — that makes us feel pampered. Every day, we sample a tasty breakfast buffet offering a wide selection of organic foods: fruit juices of all types, granola or cereals, different types of silky yogurts, many kinds of bread, soft-boiled eggs, cured meats, cakes, honey and jams. P. becomes quite fond of whole almonds kept in a jar full of flavorful honey, which we like to add to our bowl of cereals. And on the weekend, a champagne breakfast brunch is served with more delicious foods — I cannot resist the tasty smoked salmon. Copenhagen is the world’s first bike city, a city that has to be explored with a bike, or on foot. We, however, choose the latter, even if I secretly wished to have the courage to fight the snappy cold on one of the city’s bicycles. “Regarde celui-là comme il est beau,” (look at how nice this one is) I exclaim every five minutes when I stop to take a photograph; I do not even bother to remove my gloves. 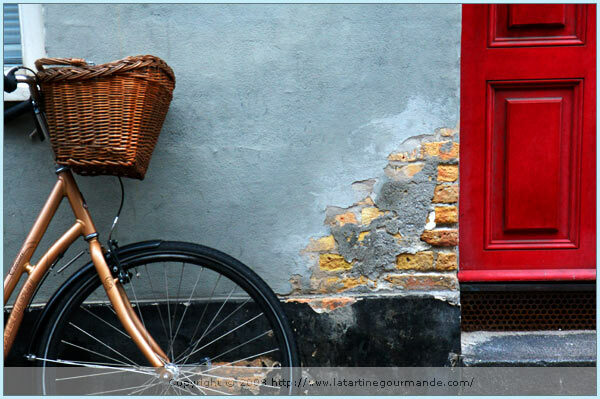 There are bikes everywhere, old and newer ones, with special bike paths and lights perfectly organized across town, a dreamland for anyone fond of la petite reine. We are beaten by a biting cold and gusts of wind that rush between buildings when we expect them the least, but the excitement to be in the city is such that we hardly seem to notice. Or perhaps it is our thick winter jackets that are working rather effectively. Either way, we walk the streets of the Danish capital until our feet are sore and our legs feel numb and tired, so much so that after only one day, some streets become familiar and feel homely. I also notice that candles are lit everywhere, on restaurant tables or in front of buildings, giving an intimate atmosphere to the entire place. 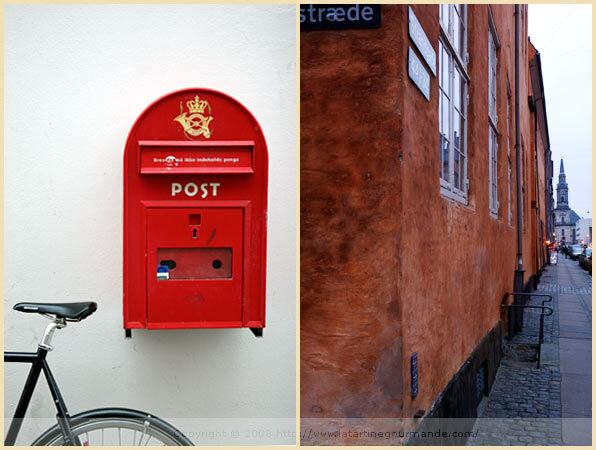 Copenhagen has a rich history and a vibrantly colored architecture, an attractive mix of contemporary and old design, with details to photograph at every corner: a heaven for me and my camera. 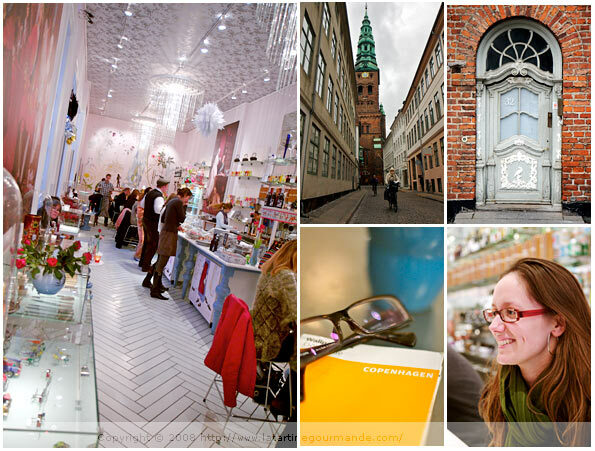 It offers great shopping too, with many designed stores that we are glad to explore despite the high price tags found on everything — yes, Copenhagen is an expensive city to visit. Since P. and I have a rule to bring a tiny something from every place we visit, I indulge. At Royal Copenhagen, I purchase two colorful mugs, and a cute small vase by Anne Mette, a local artist that we meet in her lovely store and workshop. And of course, a trip to Copenhagen would not be complete without a taste of its local food. 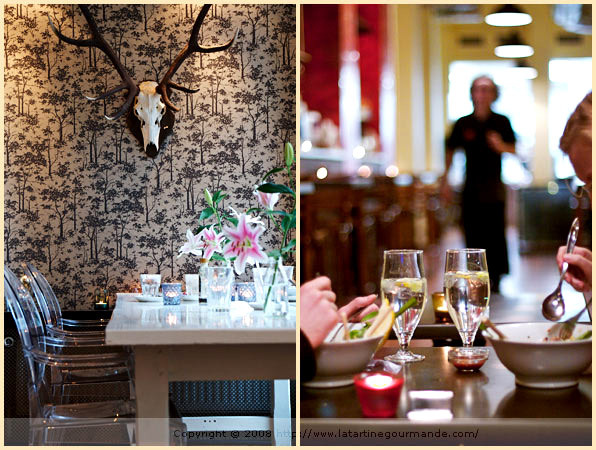 We start with dinner at Lélé, a Thai restaurant located on Vesterbrogade, because it is at walking distance from our hotel. The place is packed every night, and we soon realize why: unlike a lot of the places that we discover in the city, Lélé serves fairly good food for a decent price. We indulge in large bowls of warm soups containing rice-noodles, chicken, coriander and lemongrass, mussels infused with coconut milk, and banana coconut rice pudding. We also sample smorrebrod, open sandwiches that come with a wide selection of toppings — fish, duck, pork, pickled onions, or vegetables, to only name a few — typically found in Denmark or Sweden. My favorites end up being the ones called smushies, which we enjoy at Royal Cafe in the company of Zarah who meets us for lunch. Lucky as we are to meet with a friendly local like Zarah, we inundate her with a myriad of questions about her beautiful city, which she does not even seem to mind. One morning, when it is frigidly cold outside, we stop for tea at Cafe Flottenheimer, where we also have dinner later in the day. The food is not anything to remember, but the decor inside, a mix of modern and old with its Starck’s Louis Ghost chairs, patterned tapestry and pretty tables, is really worth the visit. 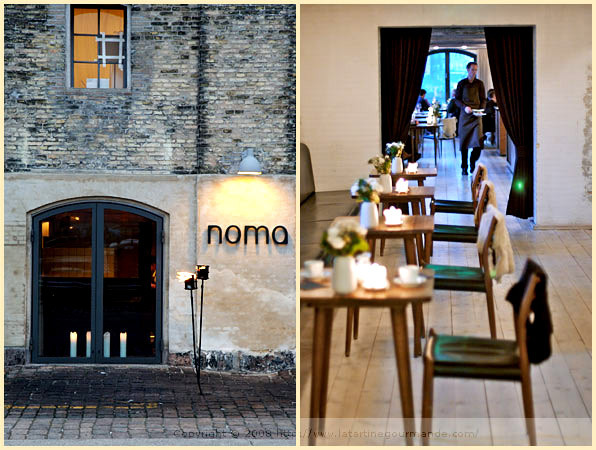 And then, there is Noma, a restaurant with two stars in the Michelin guide. 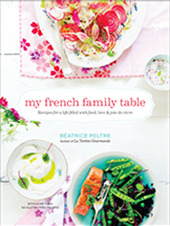 A friendly Danish reader advises me to book a table ahead because he says, it can be difficult to have a reservation. And he is right. When I email the restaurant a few weeks before traveling, I only manage to have a table for lunch. But it happens to be a much better choice since at least at that time in the day, I am able to take a few snapshots of the food, and restaurant. Noma — from the words Nordisk (nordic) and Mad (food) — is located in Christianshavn, a picturesque section of the city with colorfully painted old houses along the canals. The restaurant itself sits on the ground floor of the North Atlantic Wharf Building, a large 18th newly restored warehouse with splendid view of the city’s inner harbor. The place has everything to please us, including the delightful brown aprons that every waiting staff member wears. Inside, the design is rather minimalist and down-to-earth. There are no tablecloth, and natural materials are tastefully used for the hardwood floors and the walls: we are seduced. The staff is amiable, knowledgeable and attentive, but not overly so. Chef and owner René Redzepi is a man with great taste and an impressive set of skills. Before starting Noma, he has worked in Michelin-star restaurants like French Laundry, El Bulli and Jardin des Sens. At Noma, we find out that he particularly takes pride in using authentic Nordic ingredients which he skilfully fashions into surprising dishes, applying traditional, but also advanced cooking techniques with a lot of creativity. The food is modern and clean. We order the three course lunch menu that eventually turns into a five course menu when they bring two extra appetizers to our table. “Do you know what is going on?” I discreetly ask P.
We smile — we are wowed by the whole experience. We are starving when we arrive at the restaurant, probably from our long morning walk in the persistent cold, but despite the number of courses bigger than what we are used to for lunch, we will leave feeling light. We start with tiny delicate thinly shaved potato crisps served in a small basket, warm smoked quail eggs and a soft pastry roll stuffed with a piece of pork, a Danish tradition that the chef himself brings to our table to explain. I cannot remember the name, despite the fact that he kindly writes it down for me on a piece of paper that I am still upset for losing. The first appetizer brought to us is delightfully earthy, modern and fresh: paper-thin shaved chestnuts are served in a light broth flavored with Swedish fish roe that gives the dish a boost of flavor; the second appetizer becomes P.’s favorite: extra fine slices of beef carpaccio are nicely arranged on a plate, then topped with wood sorrel that we are told to dip in spices before eating with the mashed green vegetable spread on the plate. “I want you to grow wood sorrel,” P. exclaims after his first bite of the dish. His eyes sparkle with greed for more. We then continue with a piece of cooked-to-perfection hake served with fresh sprouted greens and a parsley emulsion, topped with a delicate lace-like piece of toasted bread. Then comes fork-tender lamb with a scrumptious celeriac mash. Dessert is of equal quality, offering a perfectly balance of sweetness in the mouth: a scoop of flavored ice-cream is served on top of a buttermilk pudding, with rum-infused golden raisins that burst with flavor when they release their juice in our mouth. We are quite tempted by the offer to have tea and more treats in the arranged-with-taste lounge area, but as I look at my watch and notice that it already indicates 3 pm, I know that we only have thirty minutes of daylight left. “You have to come back in the summer then,” he replies with a large inviting smile. Since everyone seems to say so, we will most likely follow the advice. In the hope of tasting another gorgeous meal at Noma, and then this time, to see the sunset at 11 pm every night. They have a cookbook called “Noma-Nordic Cuisine“, but it seems unavailable at the moment. Very nice post and photos. 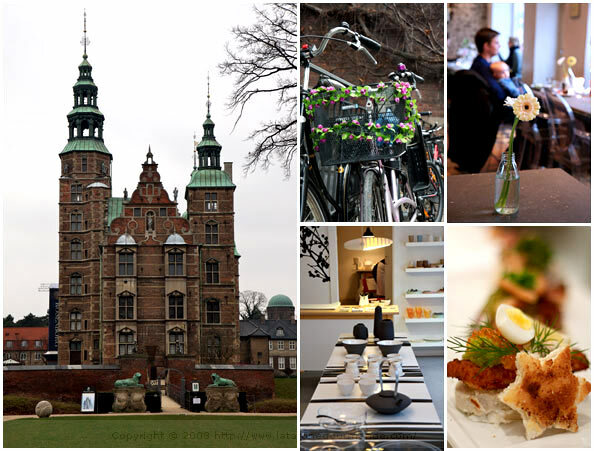 Denmark is also very high on my “must visit” list but I’m not brave enough to visit it in January. lovely travelogues! that first picture took my breath away, thank you for sharing. You mentioned earlier you didn’t want to bore us on your cutting back on gluten story, but it would not bore me, as I am doing the same! Ah, beautiful, beautiful Copenhagen. Isn’t it an amazing city to just stroll around in — the architecture, the parks, the people and the food — all feels so very accessible. But, yes, you must visit in the summer. My place in Sweden is just across the water from Copenhagen and I truly recognize those dark and cold days. Glad you both had such a great time any way. I love all of Scandinavia – and everything about the countries: food, aesthetics, weather, and people… did I mention food?! Thanks for bringing a bit of Copenhagen back to me – I haven’t been in over a decade! How have I missed this blog? Travel is such a wonderful escape – thank you for sharing these fantastic photos and stories. You have a new fan. Bea, I hope you’ll pop over to Estonia as well on your next trip to Scandinavia! P. can eat wood sorrel to his heart’s content – it grows everywhere in the forests (I often nibble them when out hunting for mushrooms, as I love their sour taste). Looks like you had wonderful time – the photos are amazing – and I’m so glad you had a chance to meet Zarah Maria. 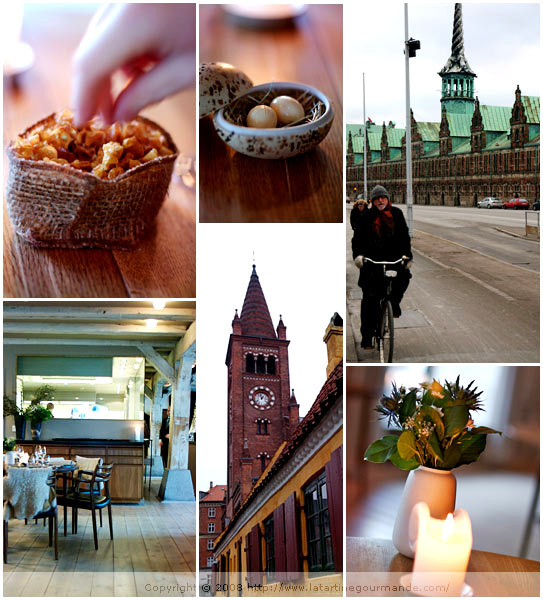 We went out for dinner when I was in Copenhagen just over a year ago, and it was such a great night! What a nice post and nice pictures! Copenhagen looks nice. Not to mention about the food. Yum! 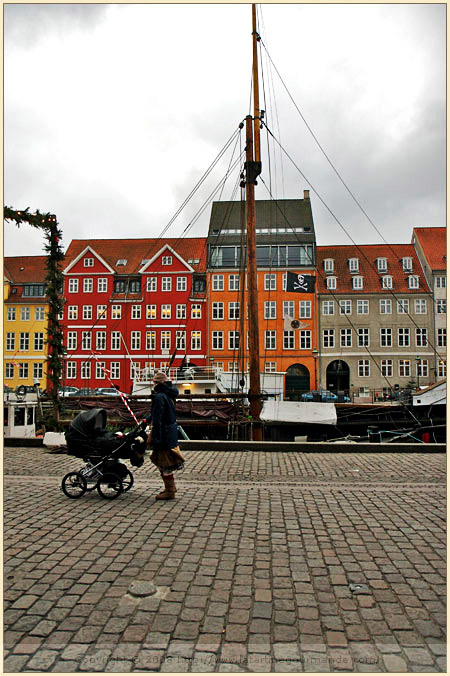 I lived in Christianshavn, on the canal at the non-boaty end of Overgaden oven Vandet – you made me homesick. If you’re still there and after another Michelin-starred restaurant, I had the best meal of my life at a restaurant on Overgaden neden Vandet called Era Ora – rustic Italian. Gorgeous. And expensive! I spent much time wandering aimlessly in that city…. You MUST try the bakery on the corner of Overgaden oven Vandet and the road from Knippelsbro, right on the canal in Christianshaven – called Lagekagehuset (Layer cake house) – stunning cakes. Please go! Tu me donnes tellement envie d’y aller, c’est etonnant comment tu arrives a faire ressortir les couleurs. magnifique. So beautiful and captured so well! Your photos are amazing! Vos photos sont magnifiques -comme toujours- et nous font rêver de voyages culturels et culinaires. Merci ! This is a great post and photos as well! I love your work. J’ai craqué, à la fois pour l’article et les photos, de cette capitale que j’aurai le plaisir de visiter en mai prochain. Je n’y resterai qu’une (courte) journée lors d’une croisière dans la Batique mais j’essaierai de tirer partie de chaque moment. Merci Béa! Beautiful photographic account of your adventures. I love that your “real life-real time” pictures are as vibrant as the ones of your food for the blog. 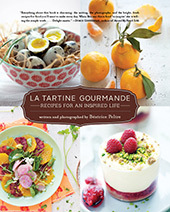 Such tantalizing photographs and beautifully written text. 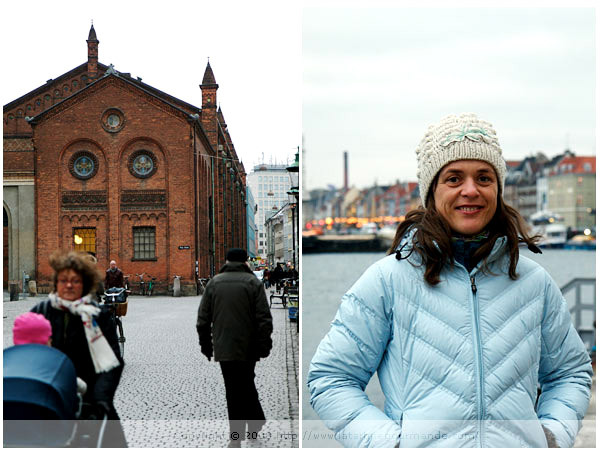 Thank you for sharing your experience in Copenhagen. I hope to make it back there soon; I was fortunate enough to have traveled there as a student in 1973. C’est toujours aussi beau par chez toi ! Et quelles photos… Merci pour ce magnifique voyage ! I love, love coming here. I know you will never let us down–always such gorgeous imagery, such delicious stories, and what a great trip! i went to copenhagen for a seminar 10 years ago and fell in love with the place… so relaxed, so stylish (don’t you just love the interior design shops?) and very friendly. 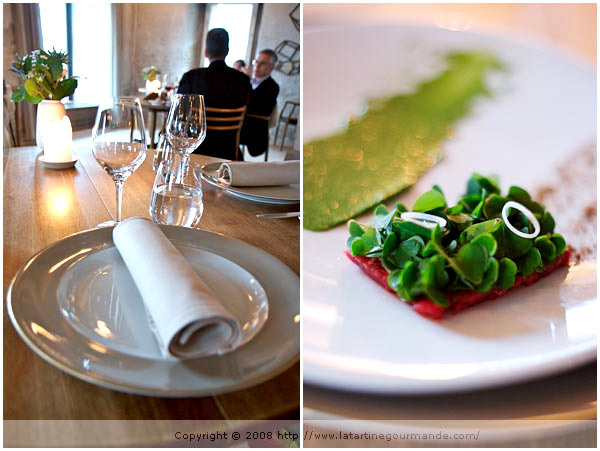 noma probably wasn’t around then or i wouldn’t have found it on my student budget – but boy, does it make me want to go! I can only repeat what you heard so often: come back in summer — the Copenhagen Jazz Festival in July would make for perfect timing! FreshAdriaticFish, yes I also have to go back in the summer! Barbara, thank you! No worries, there will be more gluten free sharing, as a matter of fact, most likely my next post. Yoyo, once again, thank you!!! Christina, Ah, we almost made it to Malmo, but were short of time. Is this where you are from? Ulterior Epicure, I share with you the love for the culture in Scandinavia. I have always had a strong attraction to it. Shalimar, you are giving it the right name: scandinavian charm indeed. I am glad you are enjoying the ride. Shawn, welcome and thank you! Pille, oh yes, I hope to get to Estonia one day too, promise. Lucky you about the wood sorrel. P. is jealous!!! Joey, that is a great thing, definitely try to make it there. Sophie, je suis persuadee que tu aimerais beaucoup, sans souci. Valerie, merci, et oui, si je suis de passage en Franche Comte, je te fais signe, avac grand plaisir. Meg, oh that is great. I will have to go back, so I keep the information preciously. Thank you. Gracianne, merci. Gentil de te part. Deb, very nice of you! Miss Diane, ah tu vas beaucoup aimer. En plus en mai, c’est un tres chouette moment pour y aller. Helen, thank you my dear. Eleanor, nice. I hope you manage to visit too. Flo, ahah frileuse? Allons bon, avec un bon manteau tout chaud, tout est possible. Ingrid, merci, et bonne annee a toi. Ninette, encore une fois un grand merci pour ta fidelite. Molly, thanks so much for your kinds words. Johanna, yes so stylish, as you say, and so friendly too. I am in love with Danish design like you. Have always been. Rasa, you are funny. I take the compliment 😉 Thanks, but seriously, the place has so much to offer in terms of beauty, not difficult to capture it. Lars, thanks so much, and many thanks for your recommendations that were really useful. 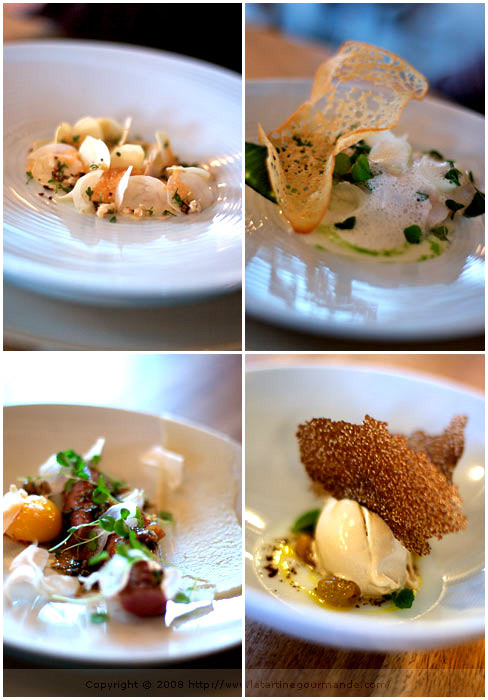 Noma was such a highlight, as well as meeting Anne Mette, and walking the streets. We will definitely go back! how in the world is it that your photos get more and more beautiful? I adore the one at the top with the bike and the red door. Wonderful photojournalism! Sigh…however beautiful you make Copenhagen look, I’m sure if I were to travel there it wouldn’t be as lovely looking as it is in your pictures. Just wonderful. No pics of the new Trippens?? Thanks Skrocjodike, Annemarie and Jasmine. Nice of you. David, ahah, I should, shouldn’t I? Next time, we have to go to Berlin to see the store! 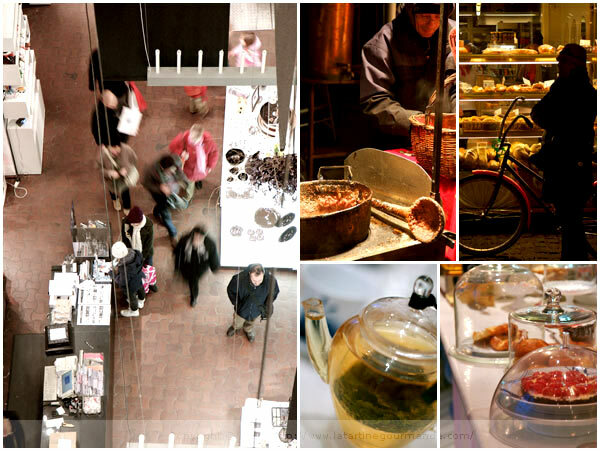 Yeah, Kopenhagen is great for design, eating and for photos!!!! I love this town very much, and your photos are splendides!!! Je crois que c’est seulement en France, où on arrive pas à parler anglais correctement…….Désolée, je sais, tu es frenchie…..Maintenant, tu dois aller à Amsterdam, Anvers et Gand, c’est dans cet esprit…. I was just starting to think about what places I should visit in the summer and Sweden and Denmark came to mind and then I saw your post. Beautiful pictures and as always the food looks amazing from your travel. I’ll surely bookmark this post and come back to it as I plan my vacation. Bea – lovely trip! Your travel photos are a wonderful testament to the value of “opening one’s eyes”.. something few of us do and something that good photography does FOR us. Nika, thanks a lot for your sweet note! Very nice of you to say so. Isn’t it amazing the details we manage to see with a camera? Lars, oh many thanks. I really enjoy the video. I want to try the outdoors pool! I had already spotted it in a travel guide. You have such a lovely presentation of good food and travels. Thank you, I’ve enjoyed my tour yet again! Bea, I see that you have been very busy, as usual! As someone with a strong aversion to the cold, Copenhagen wouldn’t have been high on my list of places to visi, but your warm description makes it sound so inviting. 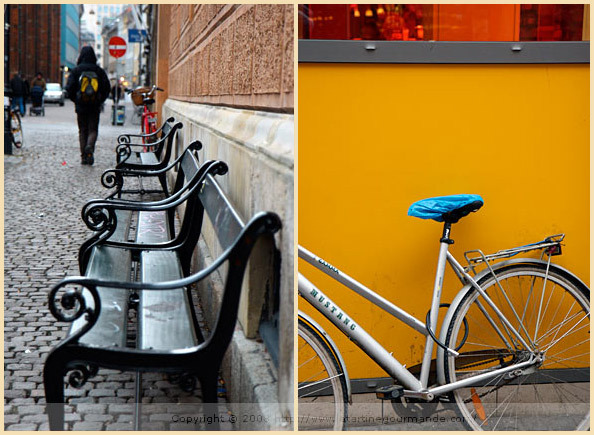 I particularly like the photos with bicycles napping on the streets. I should give you a warm welcome to Copenhagen. I’m so glad that you like the food from Cafe Lele which I’m working for. But …actually Lele is a Vietnamese restaurant. Next time,if have, please let me invite you a healthy vietnamese springroll starter to thank you so much for your inspirational dishes that teach me a lot in the kitchen. J’adore !! Je vraiment hâte de venir visiter au mois de Mai. C’est la derniere capitale scandinave que je ne connais pas. (et Copenhagen), c’est certain je vais adorer ça…..
En voyant tes photos, ce fut comme une urgence d’aller la bas ! Merci de susciter de l’envie et de l’enthousiasme! Your pictures and love of the city is exciting and wonderful. and then some! Hope to see you their very soon. for such a wonderful city as Copenhagen and its PEOPLE!